We’re heading into the fall season, which means homeowners are going to start turning on their furnaces and heating systems for the first time in several months. According to data from the National Fire Protection Association, heating equipment is a leading cause of home fires and fire-related deaths. A lot of the time, this is due to unsafe practices or faulty heating systems. 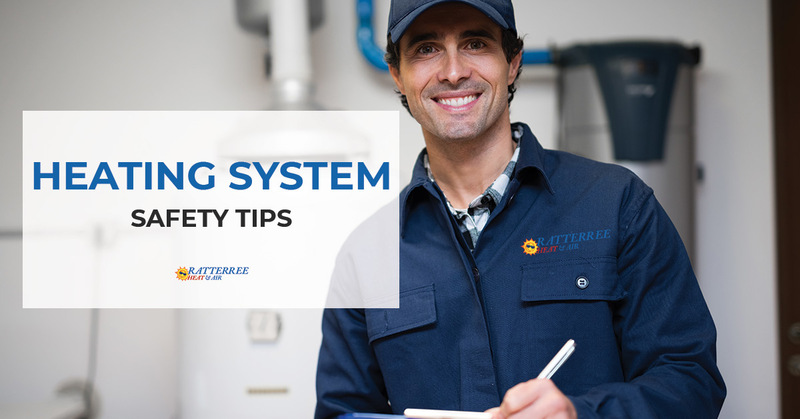 Continue reading to learn about our heating system safety tips that will keep you safe throughout the chilly fall and winter months. Schedule a maintenance check-up for your heating system. The number one step you can take to ensure your heating equipment is safe in your home for the fall and winter months is to regularly get it checked thoroughly by an HVAC professional. Even if you believe nothing is wrong with your system, it’s important to take a preventative approach to ensure it stays that way. If you wait to call a professional after something goes wrong or is already broken, you’ll likely end up with more expensive emergency costs. Our professional HVAC crew members are trained to effectively and efficiently check out any heating system you might have in your home. Call us today to schedule an appointment. Turn any mobile heaters off. When it comes to your mobile or portable heater, please turn these pieces of equipment off whenever you leave the room or your home for an extended period of time. You should also turn these heaters off when you go to sleep. It’s important to always have a pulse on your heating systems and to monitor them while they’re on. This is the best way to ensure you and your loved ones are safe in your home. Follow general heating safety rules. Keep any children from open fires or space heaters. Don’t use your oven as a means to heat your home. Only let a qualified professional install and work on your heating equipment and water heaters. Change the batteries in your smoke detector. It’s a common habit we get into as homeowners to not check our smoke alarms or carbon monoxide detectors until they start profusely beeping at us. You should be checking these safety devices every 30 days or so, and they should also be replaced every 10 years or so. As the weather gets cooler and we start to turn on our heating systems, our team at Ratterree Heat & Air wants to ensure you stay safe while also staying warm. We offer professional, personal and punctual HVAC services to the Fort Worth area, and we offer a variety of heating system services, ranging from installation and maintenance to repair. We even offer emergency services for when you are in dire need of a professional. Contact us today for your next heating service in Fort Worth. You can reach us by calling (817) 246-1866 or by filling out our online form.